The Logitech K400 looks great even without a cover. For those of us who use our HTPC, or Home Theater PC, often, it’s very important to have an HTPC keyboard to use with it. Because we have a lot of contact with our computer keyboards, and because our keyboards often bear the brunt of accidents, like falls and having drinks spilled on them, it’s important to buy a keyboard that is not only durable, but continues to work regardless of what is thrown at it (or on it, or in it – you get the point). After trying a number of different keyboards over the years, I think that I’ve finally found my holy grail of HTPC keyboards in the Logitech Wireless Keyboard K400. 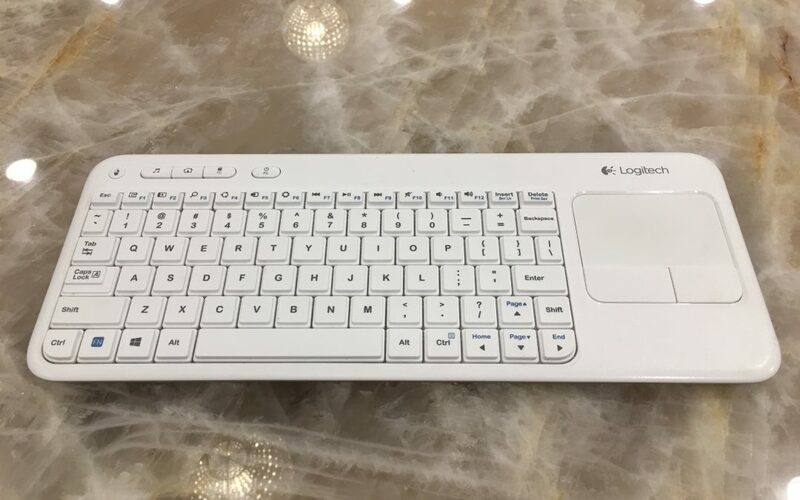 This keyboard comes in multiple colors, possesses the sleek aesthetic that Logitech has become known for, and has keys, a trackpad, and mouse buttons. It is not the fanciest keyboard I’ve ever seen, but it works flawlessly and is extremely, and consistently, durable. At a price point of only $40, I am hard pressed to think of a better alternative for such a low cost and such great lasting power. And if you’re concerned about protecting your keyboard from dirt, food and drinks, you can also buy a 3rd party keyboard cover for this device, which I recommend doing, just to be on the safe side. If you’re hoping to make your Logitech K400 feel like your own, simply add a cover. Finally: I am also currently using this keyboard with a USB to Cat5 extender, as I have my HTPC in another room. If you choose to buy a USB to Cat5 extender and want speeds over USB1, expect to incur a higher cost than you might expect. Currently, the only economic solution that makes sense is USB1 over Cat5, but hopefully this will change down the road. If you have the option to locate your HTPC in another room, so that you won’t have to deal with fan noise or hard drive clicking, you may also want to consider purchasing the USB to Cat5 extender I’m using. As always, stay tuned for more product reviews to come, and thanks for stopping by!